Veculim enables you to store scanned copies of actual documents received for ease of retrieval. 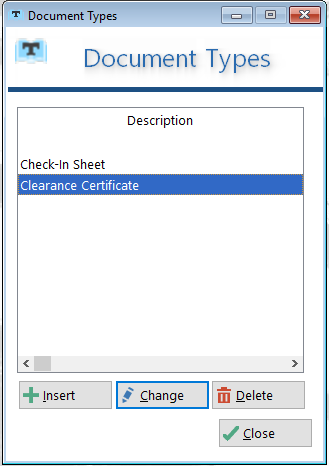 You can scan GRV documents and link those to the captured GRV, signed RFCs and various job documents signed by the customer (like the check-in sheet and the Clearance certificate). 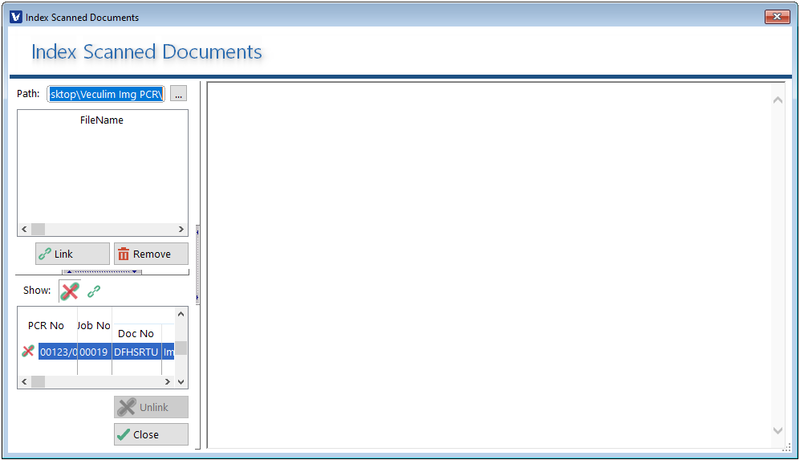 After scanning the various documents, you can easily organise these documents from The Documents Tab. On this window you can assign scanned GRV documents to the GRV entry on Veculim. Start by choosing the folder where your scanned documents were saved. Select the scanned document (which will be displayed as an image on the right for physical verification) to link to the PCR entry in the list below. Then highlight the PCR number on the bottom section. Then click on the Link button to Link the document to the highlighted PCR entry. To Remove a link that was done in error, simply highlight the PCR record in the list below and click on the Unlink button. On this window you can view the scanned and linked images. The details on the left reference back to Pastel account number, PCR number and the Job number. The next column Supplier name,Document number and Document total. You can then compare this to the image on the right hand side to make sure it is the correct document linked to the correct PCR. This is where you can add the different types of documents you wish to add to a Job. Some of the examples, displayed on this window, is the Check-In Sheet and the Clearance Certificate. After the Customer signed these documents, they can be scanned and added to the Jobcard as documents to be viewed. 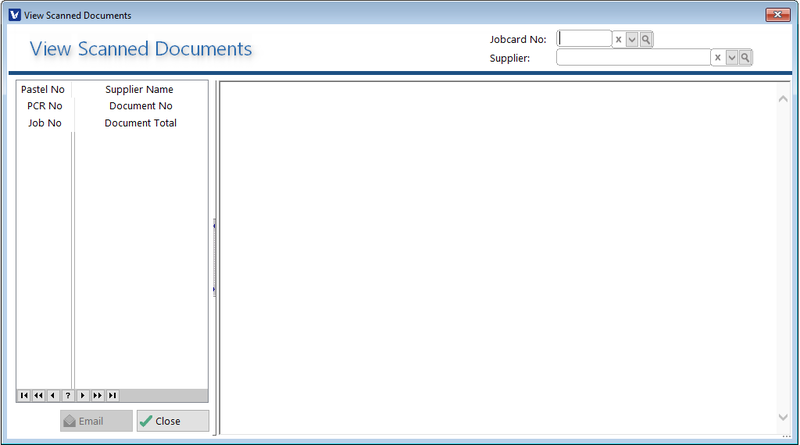 To add Documents onto a Job, Navigate to the Work Tab and Select the Jobs (In-Progress) icon. 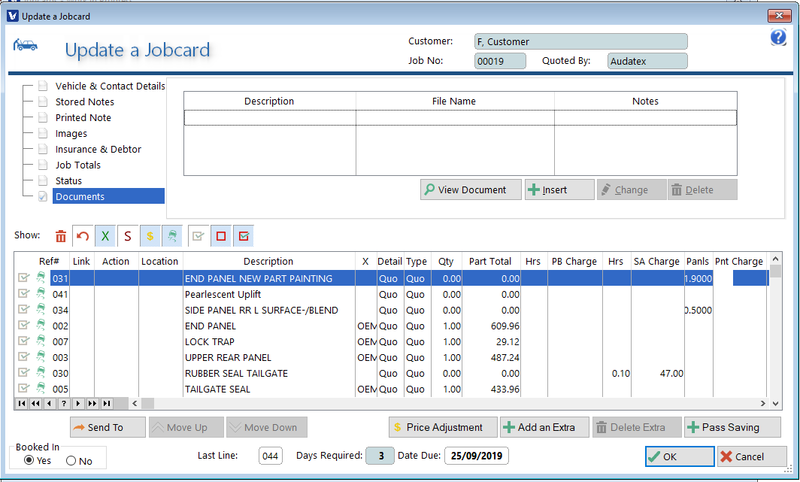 On the Work in progress window select the Job to which you wish to add the documents and click on the Change button. 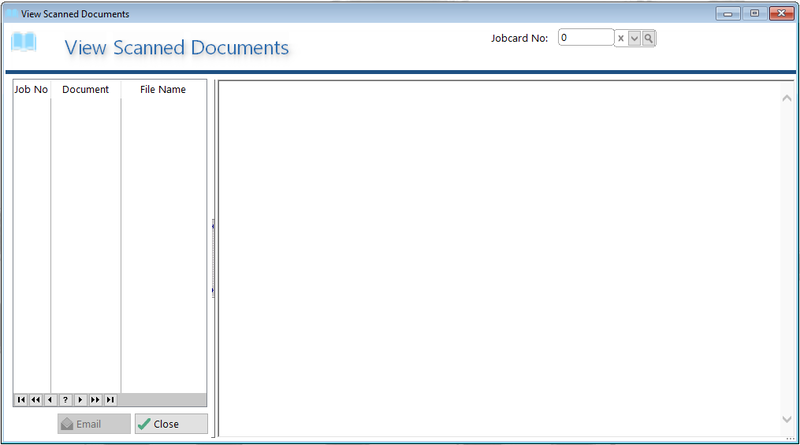 To add a Document, click on the Insert button which will display the Update JobDocuments window. When all the information has been entered, click on the OK button. You can view for any specific Job, all the documents you have added to the job.